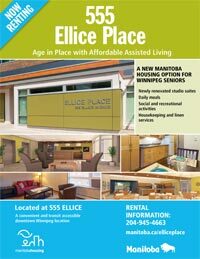 What is the Social Housing Assisted Living rental program at Ellice Place? What are the building's features and amenities? How do I get more information, book a tour or apply? What is the Social Housing Assisted Living (SHAL) rental program at Ellice Place? The Social Housing Assisted Living (SHAL) rental program offered at Ellice Place (PDF) in Winnipeg, is a new Manitoba Housing initiative that provides affordable assisted living services for seniors aged 60+. Services include meals, housekeeping and on-site activities. This assisted-living housing option at Ellice Place is a rent-geared-to-income option designed to allow seniors to age in place in their community at an affordable cost. It offers bright, modern and completely renovated suites, centrally located near Winnipeg's downtown at 555 Ellice. What are the building features and amenities? Rent is calculated according to income with an additional service package fee of $700*. The service package includes two healthy balanced meals per day, regular linen and housekeeping service and a range of social and recreational opportunities. How can I get more information, book a tour or apply? Once printed please be sure to hand write Ellice Place in the empty box at the bottom right corner of page 9 of the application, section C under Preferred Location and then sign the application on page 12. If you don't have a printer, you can request that a paper copy of the application form be mailed to you by completing an online request form or by calling 204-945-4663 or 1-800-661-4663. You can also pick up a copy of the application form at any Manitoba Housing office. Drop off the completed, signed application to any Manitoba Housing office.